We’ve compiled a list of 10 best refrigerator water filters to help you pick the right one. Our list is based on our rigorous testing, extensive research and various verified customer reviews found online. Enjoy! For more information on how we pick, rank and review products, see our editorial policy. It’s important to be informed about the 3 most common questions people ask before buying a fridge filter. If you’re in a hurry, you can jump to our top 10 list right away. 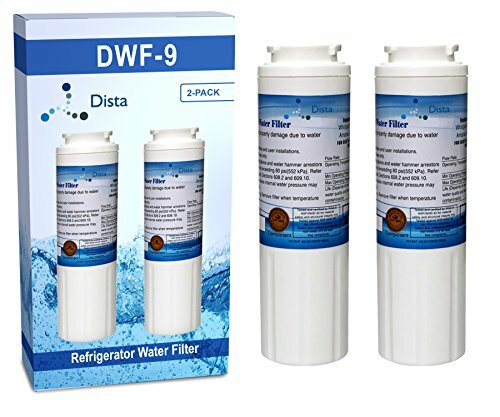 1 – Do Refrigerator Water Filters Work? Refrigerator water filters clean contaminants in the water by forcing the water through activated carbon located inside the filters. The carbon acts like a contaminant magnet trapping pollutants and particles which is why fridge filters are so effective in water filtration (source). Good Housekeeping and University of Arizona recently conducted a study which concluded that refrigerator water filters are one of the most effective ways to get rid of contaminants from water. Read full article on this topic. 2 – Is Filtered Water from Refrigerator Safe? Most refrigerator water filters remove chemicals from tap water to make it taste better. As the filter is used over time, these contaminants will clog the filter, and the water will move through the filter less efficiently and fewer contaminants will be removed (source). While it’s a hard worker, an overused filter in your refrigerator, especially one that isn’t replaced often enough, lacks the ability to properly remove harmful substances still in the water. Water that passes through old, overused filters can even dislodge some of the trapped pollutants back into your drinking water (source). 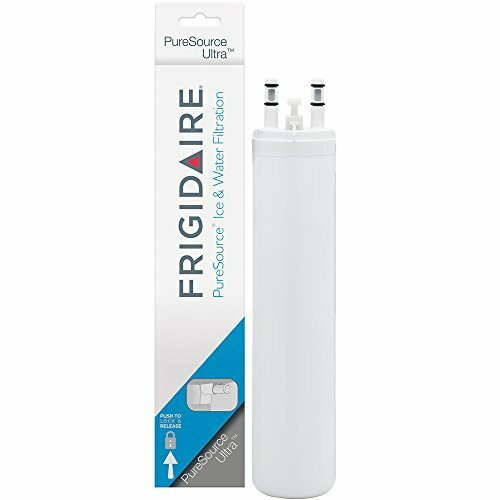 The best way to prevent side effects of using fridge water filters is to regularly replace water filters. 3 – How Often Should You Change the Water Filter in a Refrigerator? It is recommended by most experts and refrigerator manufacturers that you replace your refrigerator’s water filter at least every six months. Six months is an average but can vary widely based on factors such as usage and flow rate expectancy (source). If you’re concerned about forgetting to replace the filter, some fridge filters like Whirpool 4396710 will remind you when filter change is needed. This is one great filter that reduces up to 66 different containments that can be found in the drinking water which is NSF certified. It is really easy to use. This is a generic fridge filter which means it’s compatible with many refrigerators. 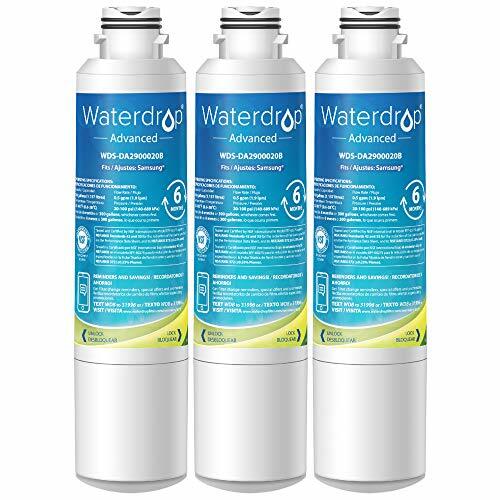 With its superior triple filtration technology, it is considered to be the best choice for the water filtration at home because it removes chemicals, contaminants, pharmaceuticals, parasites, and all other dust particles, making the water safe to drink. It has the capacity of 200 gallons and it has to be replaced once in about every six months. 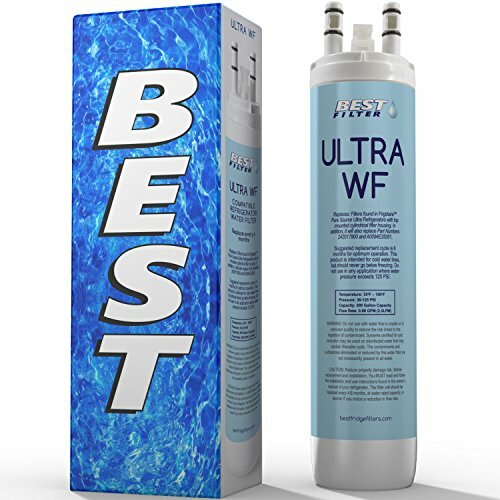 This top water filter is capable of removing elements like asbestos, lead and so many other, which is NSF certified so you won’t have to worry about the quality of your water anymore. The filter removes all the harmful components from the water, but it dwells all the components that your body needs from the water, which is health beneficial. 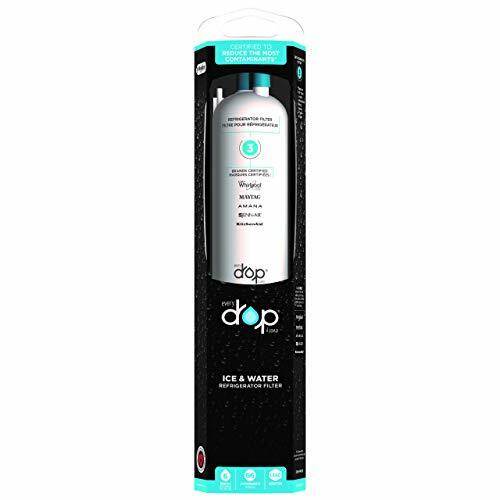 This product is compatible with a lot of refrigerator models such as Whirlpool, Maytag, Kenmore, LG, Amana and much more and the only qualification your fridge has to have is access to the filter. The filter comes in a 2-pack style and it needs to be changed once in every six months, however, that isn’t something you’ll have to put into your calendar and worry about because there is a light in the filter that turns on when it needs the replacement. Users are mostly satisfied with the product, but there are those who complained about the chlorine smell and taste of the water. The filter obviously isn’t capable of moving that chemical from the water, and although it can’t be harmful, it definitely isn’t pleasant to feel like you are drinking the pool water. This filter reduces so many contaminators such as iron, chlorine and so many other unwanted particulates from your water if changed on regular bases, of course, which means once in every six months. It works perfectly on all compatible LG fridges, just as the name brand, but for a lot less money. It is user-friendly which means that is really easy to install and it reminds you when the filter needs to be replaced. It does the great job purifying the water that has just the perfect taste and smell after the filtration and if you buy it once, you will definitely buy it again. 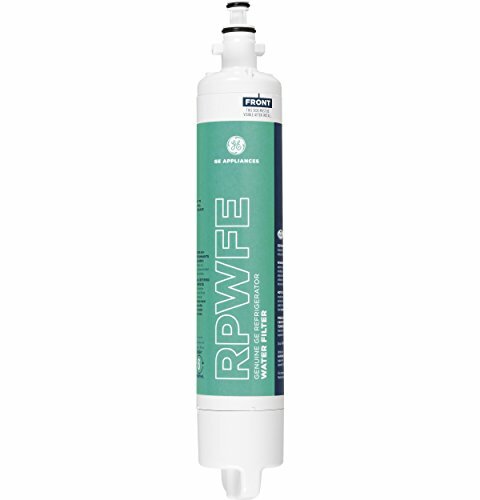 The GE RPWFE came as the replacement for the GE RPWF and it is considered ahead of its time filter because it reduces up to 98% of unwanted things from the water including chemicals and pharmaceuticals like progesterone, atenolol, trimethoprim, ibuprofen, fluoxetine, lead, mercury, asbestos, chlorine and so much more. Yes, all of that can be found in the tap water. In order to clean the water perfectly, each filter needs to be replaced once in every six months. Overall, the filter does a great job and the water tastes perfect after being filtered. 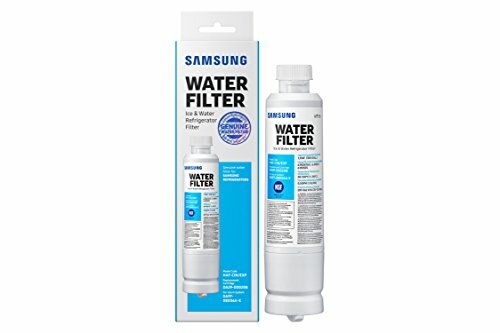 This water filter was designed to fit most of the Samsung refrigerators. It reduces the smell and taste of chlorine and so many more chemicals and heavy metals like Lead, Mercury, Lindane, 2-4-D, atrazine, and benzene that can be found in the tap water. This product has the highest quality standard, providing you with safe, clean and fresh tasting water and ice, but it doesn’t remove all the beneficial components your body needs from the water, like minerals and fluoride. This might be a good option for those of you who live somewhere where the tap water has a lot of contamination. It is capable of removing most of the chemicals and pharmaceuticals from the drinking water and with a lot less money than the filters mentioned above. It cleans your water and improves the chlorine free taste and smell without removing all the beneficial components that your body needs from the water. It comes with a really clear manual instruction which makes it really easy to install, for anyone who can read. Waterdrop DA29-00020B is designed to be compatible with most Samsung refrigerators. This water filter offers impressive filtration due to its coconut carbon filter technology. The carbon block is made out of selected coconut shell, which possesses a porous structure that’s highly contaminant-absorbent. With Waterdrop DA29-00020B you don’t have to worry about contaminants getting in your water because this product is NSF Certified. This water filter will improve the taste and the quality of your water while reducing chlorine, unwanted sediments, heavy metals and fluoride. The installation is hassle free; all you have to do is gently place the filter into your refrigerator and turn it clockwise. But before you pour yourself a glass of water, you need to remove the carbon fines by flushing out the filter for a few minutes. With just one purchase, you’ll be granted up to six months, or 300 gallons, of clean water. The amazing thing about the Waterdrop is the fact that they’re investing in clean water for children and communities. By purchasing one water filter, you are making sure that one child gets one day of clean water. 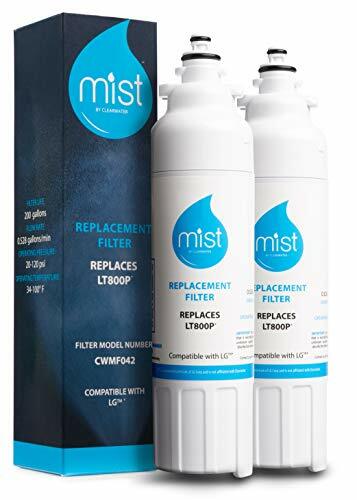 If you’ve been using OEM water filters, this can be a good replacement for half its price. I think it works even better, too. It removes most of the chemicals from the water and it improves its taste and smell if you change it on regular bases, which would be once in every six months. You might think it is loud at first, but the noise is actually coming from the incredibly fast water flow. It will take you 30 seconds the most to fill your cup. Whit the NSF certification that this water filter has, you can be sure that your drinking water is clean and safe to drink. This filter removes almost all chemicals and impurities that can be found in the tap water, like lead, asbestos, mercury and it reduces the chlorine taste and smell. It is really easy to install the Maytag UKF8001. There are few steps for installing that you can complete without anyone’s help. The life of this water filter is about six months and no matter how many times you used it, you have to replace it. However, you won’t have to worry about that because the filter has the mechanism which will remind you when the changing time comes. The Maytag UKF8001 is compatible with Jenn-Air and the Maytag refrigerators. This is one water filter with an elegant design which makes it really easy to install. It is capable of removing many containments from the water like giardia and lead which can be really harmful to your health. 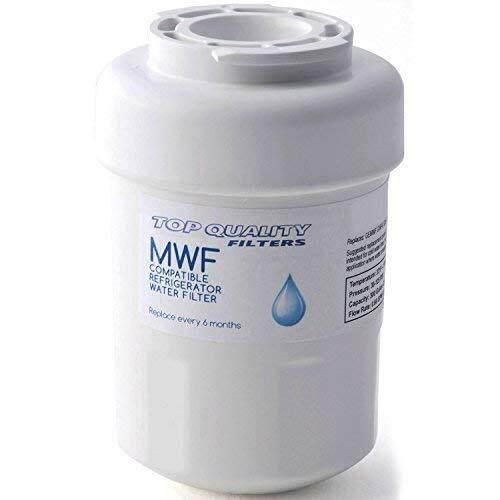 The GE MWF water filter can be a good option for those of you who have GE bottom freezer or side by side refrigerators and it has to be replaced within a six months period which is its life time. If not replaced on regular bases, no matter how many times you used it, the product won’t be efficient. The installation procedure is really easy which makes the product user-friendly. You won’t need anyone’s help to replace the filter. Most importantly, the filter is NSF certified, which assures you that the filtered water is clear and safe to drink. If you’re having trouble deciding which fridge filter to buy, make sure to go through this list to find the best filter for you. Capability to remove containment – Not every filter is for every kind of containment, so it’s really important to know what kind of pollution is in the water that flows through your tap. Once you know that it is much easier to make a choice, just take a look at the specs and see what the filter can reduce. You should also pay attention to the size of particles that the filter can remove, and to be sure that it will give you good results the filter should be rated at, at least, 1 micron or lower. Your choice is a lot limited by the fridge you own, of course, but you will always be able to find the filter that will meet all of your needs. Cost – The price tag depends only on the model of refrigerator, but there are many replacement solutions nowadays, that you don’t have to buy the brand name filter. Can you believe that some replacements are even better than the brand name filters? Well, they are. So, the cost doesn’t define the quality here. Warranty – One of the best indicators of the quality of some product is definitely the warranty period. When it comes to water filters, some companies give you a lifetime warranty, but that just doesn’t make any sense, since those things usually last for six months. Anyway, the longer the warranty, the better the product. Ease of use – When it comes to a product like this, you want to be able to replace it yourself, when the time comes. If the product doesn’t fit easily into your refrigerator or you need some professionals help to replace the filter, just forget about it. These things need to be user-friendly. How do Fridge Water Filters Work? You are probably already familiar with the term water cycle and you know that the same tap water you pour into your glass, has been wildly rushing through the river once, but it visited many unpleasant places too. How can you be sure that the water you are about to drink didn’t catch all kinds of filthiness on its way from earth and atmosphere all the way to your glass? Well, you can always use the water filter to be sure. Physical filtration actually strains the water to remove the filth. It’s like filtering through a piece of gauze or really fine textile. Most of the electric kettles have a filter that looks somewhat like that. Chemical filtration is another way to filtrate your water. This method uses an active material that removes dirt chemically from the water passing through it. Keeping your water clean and healthy is extremely important. And thanks to this little invention it has never been easier to do so. This review was written in order to help you with making a decision, not to decide for you. In the end, everything comes down to your needs and limitations of your refrigerator. 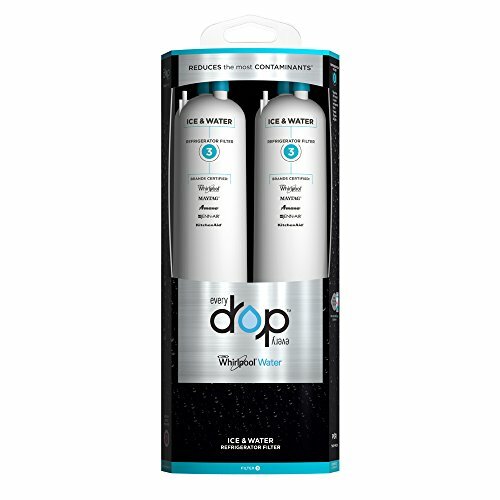 When it comes to choosing the perfect refrigerator water filter, it should be easy, just make sure that the filter is capable of removing all the containment that can be found in the water that is floating through your tap and that is compatible with your fridge. The list we made is already narrowed down to what is the best in the market these days. Healthier water is just a few clicks away!